It’s only been two years since the first pro-quality HD-DSLR (digital single lens reflex) cameras came to market from Canon and Nikon, but it’s resulted in an enthusiastic wave of directors and DPs who embrace the quality lenses, 35mm-like DOF (depth of field), and low outlay. And while the promised still camera from the folks at Red could be great competition, you can go out to B&H today and buy the latest Canon EOS 5D Mark II for around $3,300 (sans tax). Manhattan Edit Workshop offers a good way to leverage that interest with its Video DSLR Fundamentals Class. 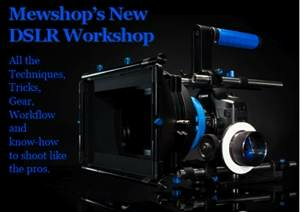 The two-day, hands-on workshop will cover the “shooting techniques, helpful tricks, infinite accessories, and known workflow solutions” for the most popular HD-DSLR models on the market. Register by January 31st (this Sunday) and you’ll get $100 off the class cost. (The class is on Feb 27-28). You can find more info here. One of the classes’ two teachers happens to be Jem Schofield, who I profiled here.